When I was a kid and I was traveling by bus I liked to stand by and watch the driver doing his work. I admired all the gadgets, pictures, strange pendants and key rings which were in his environment. But most of all I liked to watch the world through the windshield I did not know where I was going and was not interested in that. I was fascinated by the very fact of movement. I gave in this way, and I was like in a trance. The road became infinitely long thread screwed onto the big spool just beyond the horizon .... I decided to bring back my memory of this traveling by bus on this drawing. I invite you to ride the bus with the driver Zenek - The 70th! Awesome job! 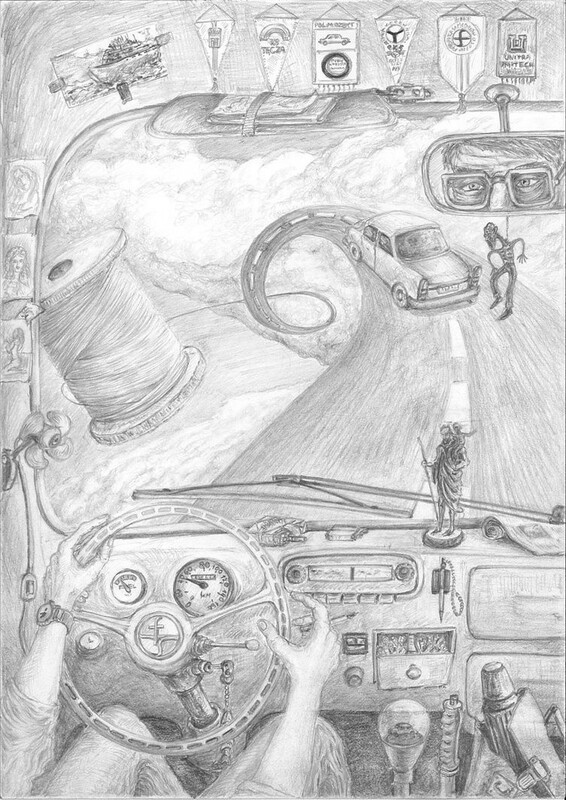 I love how much shading there is and how many details are in this!The idea of a road unraveling and twisting as a spool is so cool. It is so unique how you combined your imagination with reality of your memories. Absolutely wonderful job! This could be a museum masterpiece! Incredible details on the vehicle; good perception on the over all image as well as solid lines.